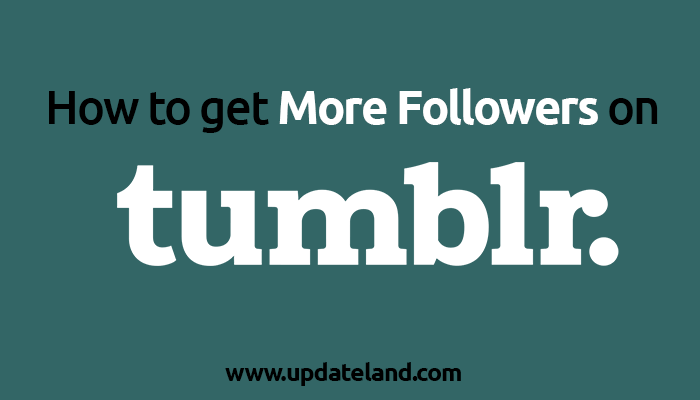 If you have recently started to use Tumblr, you must be willing to know how to get more followers on Tumblr, isn’t it? If so, then this article is just for you! It’s a comprehensive tutorial to help you get more Tumblr followers! Tumblr is one of the widely popular networks on the internet with millions of active user. To know more about Tumblr, let’s move further and check out what Tumblr actually is and why it’s important to have more Tumblr followers! What’s the Point of getting Tumblr Followers?? Tumblr is a microblogging social media network which allows users to create free blogs and post contents. It’s a wildly popular blogging network which has over 359 million blogs currently running on their platform. Tumblr allows posting any type of contents ranging from photos, videos, GIFs, TV shows, links, quips, Spotify tracks, mp3s, fashion, art, to any textual stories. Tumblr gives the perfect feel of blogging and social media with amazing features. On Tumblr, Users can follow each other, like, comment and reblog each other’s post! It was launched in 2007 and since then it’s been one of the remarkably popular networks which have reached to get over 555 million monthly visitors. Some people might have the confusion that why popularity on Tumblr matters? What’re the advantages one gets when he/she is popular on Tumblr? If the same question is hitting your brain, then here goes your answer. First of all, Tumblr has millions of monthly users that can be utilized to get more exposure and eyeballs to your stories. Many big Marketers leverage Tumblr traffic to promote their product and generate great revenue. Secondly, Tumblr is wildly popular network among the youth. Thus, creating and running blog on Tumblr to share your stories is more like a trend now. And the most important thing is, Tumblr is getting even more popular over the time. Tumblr followers don’t only give exposure to your stories, products or your content, but it’s also a style statement in today’s era! Now that you know what’s Tumblr and importance of getting more Tumblr followers, let’s dive deeper into the article and check out the tips on how to gain followers on Tumblr. Tumblr blogs are surely your personal blogs and you are free to post literally anything here. But refrain yourself from posting excessive diversify topics. The best practice before creating a Tumblr blog is to choose the niche you are comfortable with. For instance, if you are a fashion freak, it’s better to create your Tumblr blog around that niche and not on tech. Because unless you are comfortable with a topic, you can’t add value to your users. If your Tumblr blog isn’t created on a specific niche or a topic that interest you, soon you will fall short of interesting ideas. Also, you will yourself get bored of your blog in no time. Besides, people love to follow blogs that run around any particular niche. Like if your blog is nature-oriented where you post amazing pictures of nature, animals etc, then those who are nature lovers and loves to see such posts will definitely follow you on Tumblr. There are hundreds of free and premium themes on Tumblr for all kind of blogs be it cooking, fashion, tech or any other. You can select any theme that suits your blog. Just make sure the theme is not very loud in colors and gives an appealing look to your blog. Besides, you can customise the theme to make it look even better. Try to write amazing ‘about’ that manages to get more eyeballs and bring more audience to your blog. There is the basic concept behind it. You will see the contents on a blog later, the first thing you will notice is the look and layout of the blog, If a blog looks attractive, we quickly follow it without giving it a much thought! The next way on how to get more followers on Tumblr is to follow other blogs. Try following as many blogs as you can including the popular blogs in your niche! And trust me, there is a good reason to do that! Frist of all, following other popular blogs in your niche, gives the idea of what’s trending in your niche. And also, you get to see amazing content to repost on your blog. Reblogging quality contents add value to your users and more and more followers are attracted to your blog. Besides, many people believe in reciprocation on social media. If you follow other Tumblr blogs, chances are they will follow you back in order to reciprocate leading you to more Tumblr followers. Apart from this, if you read and analyze other popular blogs with lots of followers, you get to learn from their activities. You can see what type of contents leading them to that popularity and you can follow the similar approach on your Tumblr blog to achieve more followers. You can search for the blogs to follow in the ‘Find Blog’ section! Content is the king! You must have heard this phrase if you are into blogging and social media. If you post interesting and engaging stuff, more likely you will get more reblogs on that post and, of course, greater exposure to your blog. Try to be innovative while posting and reblogging stuff on your blog. Creativity and humor are loved by the audience. And they shower their love to such posts by reblogging it. Also, don’t just reblog interesting contents, but make sure to posts the original stuff as well. Because only original and interesting posts have the potential to go viral. And not to say, if any of your post, meme or other such interesting post go viral, then there is no looking back. In no time, you will see a sudden growth in your Tumblr followers and can enjoy extreme popularity! Have you seen the use of Hashtags(#) on Twitter or other social mediums? I’m sure you have. These tags help us in discovering contents on certain topics. The same concept is used on Tumblr. If you post a story on Tumblr, make sure to give it the suitable tags. So that person, who are keen to know about that type of post, can quickly discover it on Tumblr. More content discovery means more readers. And more readers means more followers. It’s pretty simple a concept. In other words, hashtags are like keywords. For instance, if you have posted an article on world war 3, give it a tag #Worldwar3. Now whenever people want to read stories related to that topic, they will search for this keyword on Tumblr. In result, your story will one of the results on that topic. But in case if you miss that tag, your content won’t be discoverable on Tumblr. If you want to get more followers on Tumblr, make sure you are active there. People don’t like following the inert accounts. Try to communicate with other fellow bloggers, like their posts and leave comments, and if possible, reblog their posts as much as you can. This gives the impressions that you are an active user and people feel curious to know about you. Besides, people have the tendency to reciprocate as mentioned earlier. So if you like, comment and reblog their posts, they are likely going to repeat the act giving more exposure to your content! And it’s pretty clear, If your posts are reblogged many times, your blog will manage to get more eyeballs leading you to more Tumblr followers. Also, try to be humble, responsive and respectful to your followers. If you will engage with your audience and will respond to their comments, they will likely feel more connected to you and this will leave a good impression on others. In return, they won’t hesitate to follow you! Posting on the right time matters a lot on social media. There is a specific time in a day when people are more active on social media and that’s the best time to post any new story. Depending on your region, that time might vary. But on a rough estimation, Tumblr is busiest between 5pm and 1am. EDT. And around 42% of all the Tumblr activities take place at that time. Also, Sundays are the most active days on Tumblr. If you post at the time when more people are active on Tumblr, you are more likely to get the better response on your post in terms of Likes, comments and post reblog. More response on Tumblr leads you to more Tumblr followers. Moreover, there is one more thing you need to take care of is the frequency and consisting. Apart from posting on the busiest time on Tumblr, make sure you maintain frequency. Posting minimum 3 times a day on Tumblr is a good practice. Now this one is must to do a practice. People on Tumblr has a certain behavior. If you analyze that behavior and check the insights of your Tumblr stats, you can deal better with your blog and generate more followers. Once you know whether these are the memes which are getting you more reblogs and followers, trending posts, jokes, GIFS or reblogs of other big blogs, you can repeat the same actions time and again to achieve more Tumblr followers. The last tip on how to get more followers on Tumblr is to promote and advertise your Tumblr blog whenever you can. Posting an article on Tumblr and waiting for it to go viral is a passive act. To get your post more exposure, give a call to action at the end of the post. Ask your existing followers to share the post on Tumblr as well as other social mediums including facebook, twitter etc. You need not rely only on Tumblr for getting more followers. Share your Tumblr on facebook, twitter, LinkedIn etc and ask your friends and followers there to follow you on Tumblr. Also, make sure to post all your latest articles on those platforms as well, since they also have a broad audience there. To achieve more Tumblr followers, you need to be polite with your readers. Respond to their queries, even when they are not worth answering for. Also, you can build a personalized relationship with your readers by personally thanking them for their kind response. Additionally, don’t get into any kind of spat with the fellow bloggers and readers, If they are being rude to you, just don’t give it a damn and engage yourself in some creative work! I guess these tips are enough to make you know how to get more followers on Tumblr? Isn’t it? Did you see how easy is to get Tumblr followers??? It’s just people don’t realize that being active and posting quality content on the regular basis is the key to obtain more and more followers on Tumblr. Instead of spending time on Tumblr to be active, they keep searching for how to get more followers on Tumblr. I hope, after going through this article, you must have understood that getting Tumblr followers is easy. All you need to do is just show your active presence there and go through all the tips mentioned in this article! If you still have any more questions regarding ‘how to get more followers on Tumblr’, feel free to ask in the comment section below. I am here to help.